I don't often like to brag about how amazing my husband is, but he is. One thing I am very, very appreciative of is his cooking ability, and that he is happy after a day at work to come home and cook! Tonight he made such an easy, healthy and delicious meal I had to share! Basically we just cooked the rice and the lentils and then chopped or crumbled everything into small pieces and mix it all in together, mix through the olive oil and lemon juice and let it stand for a while to get the flavours through the dish. Even the toddler ate this! I was skeptical if he would, but as long as we do the two spoon method he eats things like this ok (two spoon is one for me, one for him, it distracts him long enough to open his mouth and let me shovel the food in, also he is trying really hard to feed himself too). We also have plenty left over for lunch for all of us tomorrow, I can't wait to eat it again. Please try it, you'll love it! 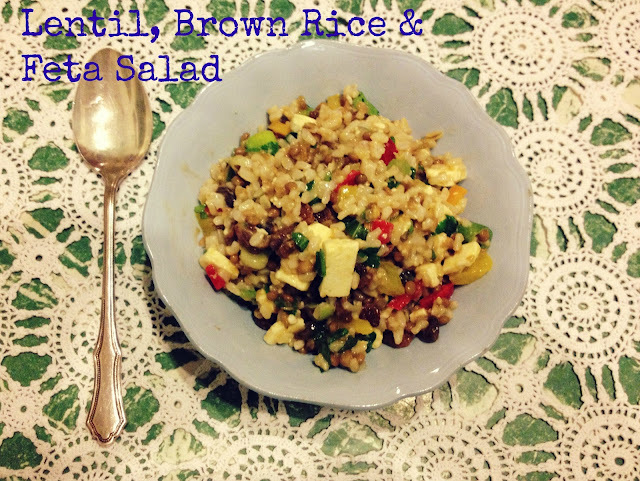 17 comments on "Lentil, Brown Rice & Feta Salad"
It looks yummy and sounds super healthy. I will most definitely try it, thanks for sharing. I love your presentation!! This looks delicious and it's gluten free by ingredient which means that I as a Coeliac can make and enjoy it! I will definitely give this a go soon. It looks delicious! I'm dairy-free too, but it sounds tasty even without the feta. This looks so good, and surprisingly the husband is prepared to give it a go. And seeing as he does all the cooking in this place that's a win for me! ooooh, that looks really tasty! I will try, I love brown rice. We don't do lentils here on account of it gives someone terrible wind and then it's no fun for anyone!! Thanks!! It is so good, I think I am going to have it again this week! It is such a win having a husband that likes to cook, and is actually good at it too!! Thanks, I think I need to brag more often, or maybe just appreciate more!! hahaha!! I have heard if you soak lentils and beans for a while (not sure how long a while is) beforehand it stops gas problems!! I should have mentioned that Sultana's are what we call Raisins, and Capsicums are red or green peppers!! Sorry! !